TL;DR: In this article, we’ll get a quick refresher on NgRx basics and get up to speed on more features of the NgRx ecosystem. We'll then walk through how to add Auth0 authentication to an NgRx app. You can access the finished code for this tutorial on the ngrx-auth GitHub repository. I remember when Rob Wormald, an Angular Core Team member, first wrote ngrx/store at the end of 2015. It was a tiny library implementing Redux in Angular (store.ts was a single file with 66 lines of code!). Fast forward a few years and NgRx is much more than a simple library — it’s an entire ecosystem with over 120 contributors! Learning to think in the Redux pattern, while also keeping up with the various structures and pieces of NgRx, can be a challenge at first. Don’t worry, though — we’ve got your back. In this article, we’ll do a quick refresher on NgRx concepts and learn about what has changed in its ecosystem in the last year. Then, we’ll look at how authentication works in NgRx and how to add Auth0 to an NgRx application. "I'm learning about adding authentication to an NgRx application." While we have a great tutorial on managing state with ngrx/store and implementing Auth0, a lot has changed with NgRx since then. Let’s do a quick recap of what hasn't changed — the fundamental concepts of NgRx and the Redux pattern. State is an immutable data structure describing the current status of parts of your application. This could be in the UI or in the business logic. State can represent a range of different things, from whether to show a navigation menu to whether a user is logged in. You can access that state through the store. You can think of the store as the main brain of your application. It’s the hub of anything that needs to change. Since we’re using Angular, the store is implemented using an RxJS subject, which basically means it’s both an observable and an observer. The store is an observable of state, which you can subscribe to, but what is it observing? The store is an observer of actions. Actions are information payloads that describe state changes. You send (or dispatch) actions to the store, and that’s the only way the store receives data or instructions on how to update your application’s state. An action has a type (like “Add Book”) and an optional payload (like an object containing the title and description for the book Return of the King). Write your actions first. This lets you plan out the different use cases of your application before you write too much code. Don’t reuse actions or use action sub-types. Instead, focus on clarity over brevity. Be specific with your actions and use descriptive action types. Use actions like [Login Page] Load User Profile and [Feature Page] Load User Profile. You can then use the switch statement in your reducer to modify the state in the same way for multiple actions. Remember: good actions are actions you can read after a year and tell where they are being dispatched. Once the store receives an action to change the state, pure functions called reducers use those actions along with the previous state to compute the new state. If you’re feeling lost on the basics of the Redux pattern, one of my favorite introductory resources is Dan Abramov’s Egghead course on getting started with Redux. With the basics covered, let’s look at some additional concepts in NgRx we'll need for this tutorial. Selectors are pure functions that are used to get simple and complex pieces of state. They act as queries to your store and can make your life a lot easier. Instead of having to hold onto different filtered versions of data in your store, you can just use selectors. // Feature selectors get registered first. // Then you can use that feature selector to select a piece of state. To learn more, check out this talk from ng-conf 2018 on selectors by David East and Todd Motto. You can see that the effect is listening for the LOAD_DATA action, and then calls the ApiService to get the data and return a new action. Using effects ensures that your reducers aren’t containing too many implementation details and that your state isn’t full of temporary clutter. For more information, check out this tutorial from Todd Motto on using effects. 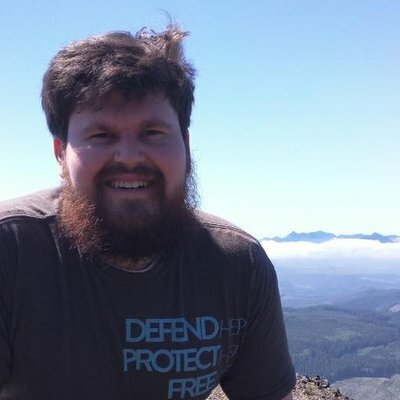 One of the most common complaints about NgRx is the amount of repetitive code that it takes to set up an application and add new features (never say "boilerplate" around NgRx Core Team member Brandon Roberts!). Part of this is due to the NgRx philosophy to focus on clarity over brevity, and to front-load the work of app architecture so that future feature additions are easy and straightforward. At the same time, there can be a lot of repetition in the code you write — adding a new reducer, set of actions, effects, and selectors for each new feature. Luckily, Angular CLI schematics are here to help. Schematics for the Angular CLI are blueprints to generate new code quickly and are a huge time-saver. NgRx has its own set of schematics that you can take advantage of when writing your application. These schematics follow best practices and cut out lots of repetitive tasks. They also automatically register your feature states, wire up your effects, and integrate into NgModules. Awesome! This will generate a store for you at the root of your application and register it in your AppModule. Pretty cool! For more information on NgRx schematics, check out the repository readme and this excellent ng-conf talk by Vitalii Bobrov. We’re caught up on the latest and greatest with NgRx, so let’s learn how to implement authentication in NgRx. "I'm learning how to use schematics, selectors, and effects to add authentication to an NgRx application." 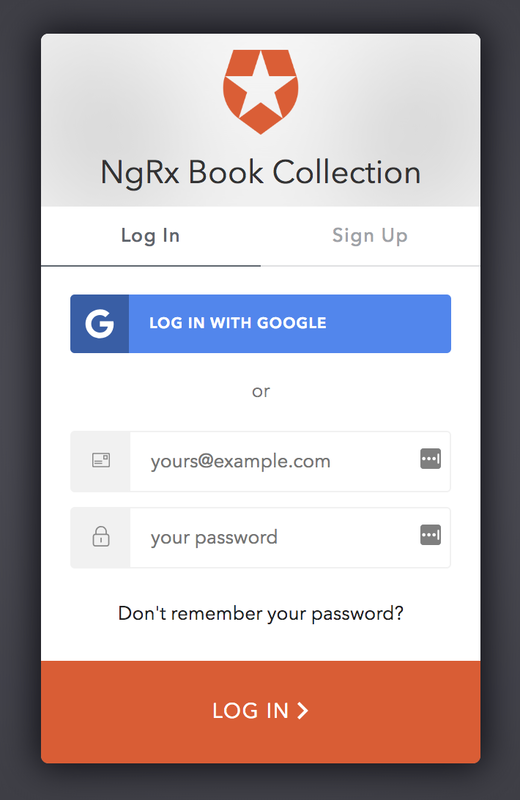 We’re going to use a heavily simplified version of the official ngrx/platform book collection app to learn the basics of authentication in NgRx. To save time, most of the app is done, but we’ll be adding Auth0 to protect our book collection through an Auth0 login page. You can now visit http://localhost:4200 to see the running application. We'll also be taking advantage of NgRx schematics to help us set up authentication in this app, so I've added them to the project and set them as the default. Our app currently has the book library (found in the books folder), as well as some basic setup of NgRx already done. We also have the very beginnings of the AuthModule. The UserHomeComponent just lets us go to the book collection. This is what we'll protect with authentication. The first phase of this task will be the basic scaffolding of the authentication state, reducer, and selectors. Then, we’ll add Auth0 to the application, create our UI components, and finally set up effects to make it all work. Before we get started, I need to make a couple of side notes. First, because this article is focused on how to set up authentication in an NgRx app, we're going to abstract away and over-simplify things that aren't specific to NgRx. For example, we won't discuss tying the book collection to a specific user or setting up authentication on the back end. Check out our tutorial on Angular authentication to learn more about those things. Instead, you'll learn the mechanics of adding the necessary state setup, adding actions and reducers to handle the flow of logging in, and using effects to retrieve and process a token. Second, almost all NgRx tutorials need a caveat. In the real world, if you had an application this simple, you most likely wouldn't use NgRx. NgRx is extremely powerful, but the setup and learning curve involved prevent it from being a fit for every application, especially super simple ones. However, it's tough to learn these concepts using a large and complex sample application. My goal in this article is to focus only on teaching the core concepts of NgRx authentication so that you can apply them to your own larger application. For more on this subject, see Dan Abramov's iconic article You Might Not Need Redux. The first step to adding authentication to an NgRx app is to define the piece of your state related to authentication. Do you need to keep track of a user profile, or whether there is a token stored in memory? Often the presence of a token or profile is enough to derive a “logged in” state. In any case, this is what you’ll want to attach to your main state. We’re going to keep it very simple for this example and just detect the presence of a valid token. If we have a valid token, we'll toggle a global piece of state called isLoggedIn. We'll come back to the reducer in this file once we've defined our actions in the next section. In a more complex application, you’ll need to think through the state of other pages that use authentication in addition to your overall authentication state. For example, it’s common for login pages to need pending or error states. 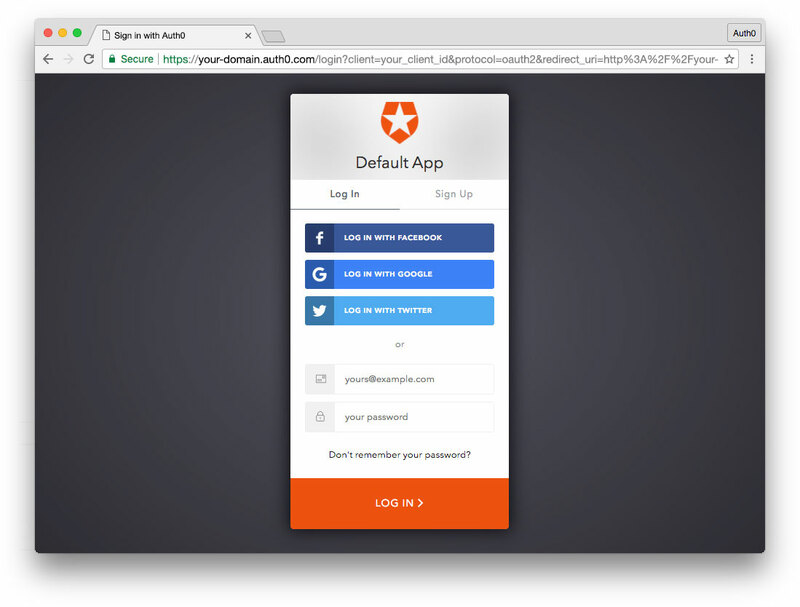 In our example, we’ll be using Auth0’s login page, which will redirect our application to a login screen to authenticate, then back to the application. Because of this, we won’t need to keep track of our login page state in this example. User clicks the “Log In” button to trigger the Auth0 login screen. After going through the Auth0 authentication process, the user will be redirected to a callback route in our application. Once that’s done, the user should be redirected to a home route. If the user refreshes while logged in, the authentication state should persist. Login — to trigger the Auth0 login screen. LoginComplete — to handle the Auth0 callback. LoginSuccess — to update our authentication state isLoggedIn to true and navigate to the home route. LoginFailure — to handle errors. CheckLogin - to see if the user is still logged in on the server and update the state accordingly. Notice that only the LoginSuccess action will modify our application state, which means that one will need to be in our reducers. The rest of these actions will use effects. User clicks “Log Out” button to trigger a confirmation dialog. If the user clicks “Cancel,” the dialog will close. If the user clicks “Okay,” we’ll trigger the Auth0 logout process. Once logged out, Auth0 will redirect the user back to the application, which should default to the login route when not authenticated. LogoutCancelled — to close the logout dialog. LogoutConfirmed — to tell Auth0 to log out and redirect home. We’ll use the LogoutConfirmed action to reset our authentication state in a reducer in addition to telling Auth0 to log out. The rest will be handled with effects. We should end up with actions, effects, and reducers folders inside of src/app/auth with corresponding TypeScript files prefixed with auth (e.g. auth.actions.ts). It's helpful to stop and re-run ng serve to prevent getting some errors at this stage. You can see that, in our example, we’re only using a payload for the LoginFailure action to pass in an error message. If we were using a user profile, we’d need to define a payload in LoginComplete in order to handle it in the reducer. Instead, we'll just be handling the token through an effect and an AuthService we'll create later. Do you notice how thinking through the actions in a feature also helps us identify our use cases? This keeps us from cluttering our reducers and application state because we shift most of the heavy lifting to effects. Now let’s circle back to authentication reducer (state/auth.reducer.ts). Since we’ve figured out what our actions are, we know that we’ll only need to change the state of our application when the login is successful and when the logout dialog is confirmed. Notice that the LoginSuccess case toggles the global isLoggedIn state to true, while the LogoutConfirmed case returns us to our initial state, where isLoggedIn is false. We’ll handle the rest of our actions using effects later on. We've defined our isLoggedIn state, actions related to our login process, and a reducer to modify our application state. But how do we access the status of isLoggedIn throughout our application? For example, we’ll need to know whether we're authenticated in a route guard to control access to the home and books routes. We’ve now got all the basic scaffolding set up for an authenticated state. Let's start setting up our authentication process. Once you've got your account, you can set up an application to use with our NgRx project. We'll only be setting up a Single Page Application (SPA) in Auth0 since we're using the Google Books API as our back end. Go to your Auth0 Applications and click the "Create Application" button. Name your new app, select "Single Page Web Applications," and click the "Create" button. You can skip the Quick Start and click on Settings. Add http://localhost:4200 to both Allowed Web Origins and Allowed Logout URLs. Copy down your Domain and Client ID. We'll use them in just a minute. If you'd like, you can set up some social connections. You can then enable them for your app in the Application options under the Connections tab. The example shown in the screenshot above utilizes username/password database, Facebook, Google, and Twitter. Note: Under the OAuth tab of Advanced Settings (at the bottom of the Settings section) you should see that the JsonWebToken Signature Algorithm is set to RS256. This is the default for new applications. If it is set to HS256, please change it to RS256. You can read more about RS256 vs. HS256 JWT signing algorithms here. Note: if we were using an API identifier, we would add an audience property to this configuration. We're leaving it out here since we're using the Google Books API. This file stores the authentication configuration variables so we can re-use them throughout our application by importing them. Be sure to update the YOUR-AUTH0-CLIENT-ID and YOUR-AUTH0-DOMAIN to your own information from your Auth0 application settings. We're now ready to set up the main engine of authentication for our application: the authentication service. The authentication service is where we’ll handle interaction with the Auth0 library. It will be responsible for anything related to getting the token from Auth0, but won’t dispatch any actions to the store. We're setting the different URLs here in the service in case multiple places in the application need to perform this redirection. We'll now need functions to handle logging in, setting the authentication, and logging out, as well as a public getters for our URLs and whether we're logged in. We'll use a flag in local storage to track that the application is authenticated. That way we can check for that flag and call checkSession to update our state. Auth0 is handling logging in and logging out, and we have a setAuth method to set the local storage flag. If we needed to return the token for use in the store, we'd do that here. We're going to handle much of the flow of our authentication using effects. Before we set those up, though, we're going to need some components. We've got the authentication service set up, but now we need to build out our UI. We'll need components for logging in, a callback component for Auth0 to redirect to, a logout dialog, and a logout button on our user home screen. We'll also need to add some routing, and we'll want to add a route guard to lock down our home route and redirect users back to the login route if no token is found. We need to create a login route with a simple form that contains a button to log in. This button will dispatch the Login action. We'll set up an effect in just a bit that will call the authentication service. Notice that we'll be passing the onLogin function into our form, which will dispatch our action. We should be able to build the application, navigate to http://localhost:4200/login, and see the new form. Of course, nothing will happen when we click the button, because we don't have any effects listening for the Login action yet. Let's finish building our UI and then come back to that. Once Auth0 successfully logs us in, it will redirect back to our application callback route, which we'll add in this section. First, let's build the CallbackComponent and have it dispatch a LoginComplete action. Once again, if we build the application and run it, we're now able to navigate to http://localhost:4200/callback and see the new component (which, once again, will do nothing yet). For logging out of the application, we'll need a confirmation dialog, as well as log out buttons on the user home and books page components. And that's it! Now we just need to add the logout confirmation. We're going to use Angular Material to pop up a confirmation when the user clicks log out. You're probably seeing an error in the console at this point. That's because there is one thing that the CLI didn't do for us. We need to create an entryComponents array in the NgModule decorator of AuthModule and add the LogoutPromptComponent to it. Entry components are components loaded imperatively through code instead of declaratively through a template. The LogoutPromptComponent doesn't get called through a template, it gets loaded by Angular Material when the user clicks the Log Out button. We'll create an effect for Logout to open the prompt, listen for the response, and dispatch either LogoutCancelled or LogoutConfirmed when we wire everything up in just a bit. We've added our login and logout components, but we want to ensure that a visitor to our site can only access the home route if they are logged in. Otherwise, we want to redirect them to our new login route. We can accomplish this with a CanActivate route guard. Let's break down what's happening here. When this guard runs, we first call the function checkStoreAuthentication, which uses the selector we created to get isLoggedIn from our global state. We also call checkApiAuthentication, which checks if the state matches authenticated on our AuthService (which we get from local storage). If these are true, we return true and allow the route to load. Otherwise, we redirect the user to the login route. We'll want to add this route guard to both the home route (in our AuthModule) and our books route (specifically, the forChild in BooksModule). We did it! If we run ng serve, we should no longer be able to access the home or books route. Instead, we should be redirected to login. Note that we haven't added any sort of 404 redirecting here. To do that, we'd want to add a wildcard route and a PageNotFoundComponent to redirect to. You can read more about wildcard routes in the Angular docs. We just have one last UI piece to add. We need to dispatch the CheckLogin action when the application loads so that we can retrieve the token from the server if the user is logged in. The best place to do this is in the AppComponent (src/app/app.component.ts). You won't notice anything different when you run the application, because we'll be calling checkSession on the AuthService from an effect. So, let's put it all together by creating effects that will control logging in and out in addition to checking for persisted authentication. Alright, friends, we're ready for the final piece of this puzzle. We're going to add effects to handle our authentication flow. Effects allow us to initiate side effects as a result of actions dispatched in a central and predictable location. This way, if we ever need to universally change the behavior of an action's side effect, we can do so quickly without repeating ourselves. All of our effects will go in auth/effects/auth.effects.ts, and the CLI has already connected them to our application through the AuthModule. All we need to do is fill in our effects. // Delete both of these lines. We'll use all of these in our effects. Let's add our log in effects first. Let's break down what's happening in each of these. Login — calls the login method on AuthService, which triggers Auth0. Does not dispatch an action. Login Complete — calls parseHash$ on AuthService, which returns an observable of the parsed hash. If there's a token, this effect calls setAuth, clears the hash from the window location, and then dispatches the LoginSuccess action. If there's not a token, the effect dispatches the LoginFailure action with the error as its payload. Login Redirect — This effect happens when LoginSuccess is dispatched. It redirects the user to home (using the authSuccessUrl property on the AuthService) and does not dispatch a new action. Login Error Redirect — This effect happens when LoginFailure is dispatched. It redirects the user back to login (using the authFailureUrl property on the AuthService) and does not dispatch a new action. On your first login, you'll need to click the "Sign Up" button to create a user. Alternatively, you can manually create users from the Auth0 dashboard. In either case, you'll receive an email asking you to verify your email address. Your first login to the application will also trigger an "Authorize App" screen requesting permission. Just click the green button to continue. Once you're all signed up and logged in, you'll be redirected to the home route, where you can click the button to view the book collection. Of course, we can't log out yet, so let's add the effects for that now. Note: You can also use Google to sign up and log in. However, be aware that you will need to generate a Google Client ID and Client Secret in order to complete this tutorial. This is great, but if we refresh the application, we'll lose the access token. Because we already set up the flag in local storage and the route guard is checking for that flag, our application will appear to be logged in on refresh. However, we haven't called checkSession yet through Auth0, so we'll no longer have the token. Let's add the effect for CheckLogin to fix that. When CheckLogin is dispatched, this effect will call checkSession on the AuthService, which, like parseHash, returns token data. If there's token data, the effect will call the setAuth method and dispatch the LoginSuccess action. If there's an error, the effect will dispatch LoginFailure. Those actions will work the same way as with logging in - navigating to home on success or login on failure. Let's check if it works. Run ng serve, navigate to http://localhost:4200, and log in. Once we're back at the home route, refresh the page with our browser. We should not be redirected back to the login route, but remain on the home route. Awesome! Here's a challenge for you: how might you update this feature so that you can persist the previous route, too? That way a user would land back on books when refreshing. Let's add our final two effects to finish off this application. Logout Confirmation — This effect will display the log out confirmation dialog. It will then process the result by dispatching either the LogoutConfirmed or LogoutCancelled actions. Logout — This effect happens after LogoutConfirmed has been dispatched. It will call the logout function on the AuthService, which tells Auth0 to log us out and redirect back home. This effect does not dispatch another action. Running ng serve again should now allow us to log in, view the book collection, and log out. Be sure to check if we can also log out from the home route! Remember, you can access the finished code for this tutorial here. We've spent time laying the foundation of a basic authentication flow in a very simple application. However, we could easily apply this same setup to a much more complex application. Scaling the setup is very minor, and adding new pieces of state, new actions, or new side effects would be relatively easy. We've got all the building blocks in place. For example, let's say you needed to add the access token to outgoing HTTP requests as an Authorization header. You've already got what you need to get this working quickly. You could add tokenData to the authentication state and create a selector for it. Then, add the token data as the payload of the LoginSuccess action and update the effects that use it. Once that's all set up, you could then create an HTTP interceptor to select the token data from the store and add it to outgoing requests. Now that the foundation of the authentication flow has been built, the sky is the limit for how you want to extend it. My goal for this tutorial was to keep it simple while helping you understand some new, fairly complex concepts. I hope you can take this knowledge and use it in the real world — let me know how it goes!